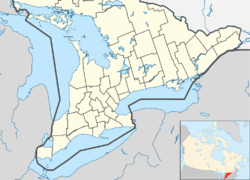 Teeswater is a community in the municipality of South Bruce, Bruce County, Ontario, Canada. It is located 12 kilometers west of Mildmay, 16 kilometers north of Wingham on County Road 4, and 25 kilometers southeast of Ripley on Bruce Road 6. The population in 2011 was 1,011. Teeswater is located on the Teeswater River, a tributary of the Saugeen River. Surveyors named the river after the River Tees in England and the settlement was named for the river. The first settlers, mainly English and Scottish, arrived in 1856. Teeswater was incorporated as a village in 1875 and remained a separate municipality until it was amalgamated with Culross Township to form the Township of Teeswater-Culross in 1998. In 1999, Teeswater-Culross was itself amalgamated with the Township of Mildmay-Carrick to form the new municipality of South Bruce. Teeswater is the administrative centre of South Bruce and the largest community in the municipality. A weekly newspaper, The Teeswater News was published from 1871 until 1996. The building where the weekly newspaper was published burned down. Now in its place is The Kinsman Memorial park. The park was finished October 2008. Like many other Ontario villages, Teeswater nurtured a musical tradition as it grew, supporting first a string orchestra and a later a flourishing concert band. It is home to the prize-winning Teeswater Highlanders Pipes and Drums (established in 1961), which regularly presents concerts on the lawn beside the Town Hall. Knox Presbyterian Church was built in the 1870s, and is now a continuing congregation of the Presbyterian Church in Canada. Another church of the same denomination, Westminster Presbyterian Church, burnt to the ground in the 1970s. Teeswater United Church was built in 1879 as the Wesleyan Methodist Church. It became the Teeswater Methodist Church in 1884, and since 1925 has been affiliated with the United Church of Canada. Sacred Heart Roman Catholic Church was built around the same time as the two Protestant churches, and is located next to the school of the same name. In the past, Teeswater has been home to churches of the Anglican, Baptist, Pentecostal, Free Presbyterian, Episcopal Methodist, and Wesleyan Methodist faiths. Now there are only three churches: the Roman Catholic, United, and Presbyterian. The village is currently home to two schools, Hillcrest Central Public School (Bluewater District School Board), and Sacred Heart Catholic School (Bruce-Grey Catholic District School Board and the middinight school east of teewater. Teeswater has the Bruce County Public Library, Teeswater branch. It is a Carnegie Library. After years of stagnant growth Teeswater has recently begun to rebound as a result of a major new infrastructure project to replace homeowner septic systems with a community sewer system in Teeswater and Formosa. The population of Teeswater has remained fairly constant over the past 100 years at approximately 1100 (at a time when small towns and villages in the area have seen their populations shrink). This is due to fairly stable employment at major industries such as Bruce Power and innovative new farm industries such as goat farming. With the new infrastructure project due for completion in 2013 - 2014, Teeswater looks to renewed growth in the near and far future. Teeswater once had a Home Hardware on the village's main street. This Home Hardware closed years ago, but the sign on the side of the building remains. Teeswater was a site of 2 commercial grist mills, Littles mill, and the Teeswater & district Co-op grist mill. Littles mill is still standing and is now a house, with the mill pond and river dam still in place. The co-op mill burnt down in 1976, and the dam taken out in about 1991. The pond location and dam bed can still be seen today. For many years before and after the mill burned down, children would go and play ice hockey on the frozen mill pond. The site of the co-op mill building is located near the Teeswater Creamery holding tank for spoiled milk. Teeswater Creamery was first established in 1875, and has been a major provider of employment since then. It was run by Thompson Brothers from 1932 until 1981, when it was sold to Gay Lea Foods. The Teeswater-Culross Fire Hall occupies the former British Petroleum Canada (BP) service station. Alex Casagrande began operating at the location in 1954 when it was a Cities Service station. In 1959, the service station was destroyed by fire. The lot was purchased by Mr. Casagrande and a new garage was erected under the BP banner. In 1976, Mr. Casagrande retired and the garage was sold to the Teeswater-Culross Fire Department. Jennie Fletcher (swimmer) moved to Teeswater after winning gold for Britain in the 4 x 100 swimming relay during the 1912 Olympics. In Teeswater she taught swimming in the mill ponds and was guest of honour when the community opened its first swimming pool. James Gilles (C.M., M.P.). Born in Teeswater in 1924 and having attended primary and secondary school in the community, Dr. Gilles went on to become the founding Dean of the Schulich School of Business and an M.P. during the 30th Canadian Parliament. Dr. Gillies was also a member of the Royal Canadian Air Force during World War II. Frank Leahy (Fiddler). The youngest person to ever win the Canadian National Fiddling Championship, he has been described as an innovator, as much at home as a champion fiddler and master of the full gamut of clogs, reels and jigs as he is in other genres, such as jazz, swing, big band and classical. He was born in 1961 in Teeswater and started playing at home when he was three years old. Bob Worrall (Piper). One of North America's leading teachers, adjudicators and performers, Bob was born and raised in Teeswater. He won the North American Professional Championship an unprecedented seven times, and held the Ontario Championship Supreme title for 12 of his 13 years in professional competition. In 1977, he was winner of both the March and the Strathspey/Reel events at the Northern Meeting in Inverness, Scotland. Mary Riter Hamilton (Painter) was born in Teeswater in 1873. Shortly after her birth, the family moved to Clearwater, Manitoba. In 1919, she painted the battlefields of France and Belgium, recording the aftermath of World War I. She has been dubbed "Canada’s First Woman Artist", although this is chronologically false. ^ Anthony Blackbourn; Robert Garth Putnam (1984). The Industrial Geography of Canada. Croom Helm. p. 25. ISBN 978-0-7099-0622-3. This page was last edited on 17 November 2018, at 19:20 (UTC).